The Parish Church needs some significant internal updating. The Parish Church Committee are planning to combine this renovation (called “re-ordering”) with changes that would make it more useful and available to the community. This is because there is no village hall or centre for the community in St Asaph. We are working closely with the St Asaph Community Association and the St Asaph City Council in this project and are consulting widely. We are applying for grant funding for this project, as well as undertaking local fund-raising. Outline details of the proposals are below, and also on the re-ordering notice board in the church, which is open every day. It is always important to hear reactions to what is proposed in these changes – so if you wish to comment, either send an e-mail via the ‘contact us’ webpage, or write on the comments sheets provided by the re-ordering notice board in the back of the church. We are very pleased to have appointed the architect Mr Graham Holland, of Graham Holland Associates (Knutsford and Ruthin) to act on our behalf. The proposals include levelling the floor, installing under-floor heating, and insulating the roof. In the North West corner of the church, there will be toilets, a kitchen and a quiet room, with a mezzanine floor above. There will be changes to the orientation of the altar, and to the current seating arrangements. 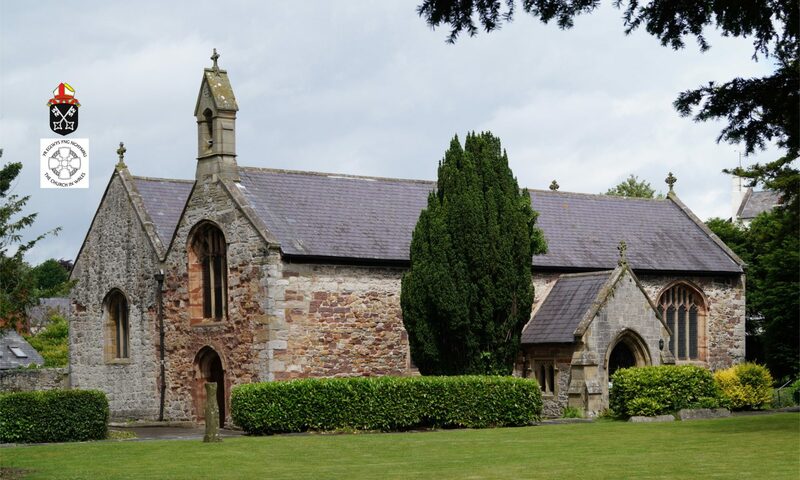 We hope the changes will help it serve as a warm and welcoming venue not only for church services, but also for the whole of the St Asaph community, to provide a wide range of activities throughout the week. For example, these might include a lunch club for senior citizens, mother and toddler groups, small concerts, exhibitions and lectures; indeed our recent survey which included the handing out of questionnaires to every residential property in St Asaph, provided us with a clear indication of the needs of the community which we hope this project will help to address. The range of activities already provided and those in the pipeline can be viewed on this web-site. Please read on below for more details of why the extra facilities and changes are required. These images illustrate a scale model of the proposed design of the re-ordered church. This physical model provided us with a visual perspective and a clear interpretation of the architect’s drawings, allowing us to better comprehend the structural design. Firstly, the plans have recently been updated, as have the images of this 3D model above. The amendments were considered during and following a recent and requested visit to the church by Canon Peter Moger. Peter Moger is canon precentor of York Minster, and formerly National Worship Development Officer for the Church of England, and he together with our local clergy provided specific liturgical advice in relation to design and placements. Considerations had been previously raised of the direction of axis for worship; it was eventually decided to keep the traditional west/east axis for worship, so that the building is very clearly still a church as people enter into it. The size and shape of the sanctuary has been slightly changed, it now extends just beyond the first pillar from the east on both the west and north sides, with a gently curved single step. This allows a symmetrical view of the altar from both north and south naves, and allows for celebration of the Eucharist in the north or south nave or in both naves, according to the size of the congregation. The south west window, or the first window on the right as entering the church, with its water-based narrative, will be a suitable location for the sighting of the medieval stone font. The area of new facilities, covered by a mezzanine will be of timber construction that does not intrude on historic stone structures or architectural features; the area will accommodate the kitchen, quiet room, toilets and shower, storage, and upper gallery with disabled access. Why have all these changes? The installation of a new kitchen to current standards is needed to develop community use and be able to offer hospitality during outreach work – e.g. Messy Church, Forget-Me-Not Teas and lunches for the elderly. There will be a quiet room with direct, well-signed and easy access from the main door. This quiet place will ensure continuity of a place for prayer, reflection or consultation if the main body of the church is being used for community activities or church events during the daytime; maintaining a sacred space at all times. There will be 2 unisex toilets and 1 easy access toilet and shower with baby changing facilities, which will comply with the need for wheelchair access. So why a shower? The church is on the North Wales Pilgrim’s Way (Taith Pererin) route which runs from Basingwerk in the east to Bardsey Island in the west (130 miles), so there will be a place for ‘champing’ in church, that is, overnight stays in church for the ‘pilgrims’ with facilities to freshen up before they set out on their onward journey. The mezzanine gallery with stair lift for disabled access will provide a large space for exhibitions and workshops, and provide an ideal space for displaying artefacts relating to the history and heritage of this medieval building. The area will double as overflow for large events. The vestry area will become dual purpose, and will be able to provide a stand-alone meeting room facility with separate external access. A new energy efficient eco-friendly heating system that will include underfloor heating will ensure that the building is comfortable for all; its zoned system will prevent unnecessary wastage and thus reduce heating costs. The installation of a phone and fast-internet WIFI will increase security. It will provide internet access to allow podcasts, and interactivities that are in high demand by the young and the not-so-young alike, and enable web access for classes and courses. It will also allow remote control of heating and CCTV. The replacement of the present outdated lighting system will improve green credentials, reduce running costs, and provide zoned and dimming facilities to enhance the user experience. A new audio visual and sound system will provide zoned speakers, upgraded hearing loop systems, radio microphones, and links for i-pods or Bluetooth which will be particularly useful for children’s areas. These are our hopes, our ambition. Through dedication and with the support of our congregation, our community, and all who support us, near and far, we pray that we shall soon be able to turn our aspirations and our plans into reality. If you feel that you can or wish to help in any way please e-mail your comments to stasaphparishchurch@btinternet.com or use the ‘Contact Us’ box on this site. Then there is ‘Giving’ – We don’t tend to talk very much about money as a church. It can be off-putting, and we never want anyone to feel under pressure. However, giving is an important part of discipleship, and we do believe in being a generous church, addressing and giving to the needs around us. Simply put, giving is part of our community life together. If you feel that you are able to assist by donation towards this project, or towards the church in general, then please go to our ‘Giving’ section (or just search Giving) and use the simple on-line ‘Giving’ facility or any of the other preferred methods of donating. All donations, however large or small, will help to sustain this historical medieval church, to be a place of welcome and friendship for everyone who worships here, for our community, and for our visitors. We are very pleased to acknowledge that the National Churches Trust (www.nationalchurchestrust.org) are supporting our re-ordering project; we have already received from them a Project Development Grant of £7350 which has enabled to make sound and substantial progress in the early stages of this work. The Church in Wales has allocated a three-year fund to grow the future church. Called the Transformation Fund, the pot of money is being used to initiate substantial change in Mission Areas across the Diocese of St Asaph. We are extremely fortunate and thankful to have received a sum of £15,000 that will assist us greatly in furthering our ambition and proposals to transform and greatly enhance the St Asaph Parish Church as detailed in our Reordering scheme above.